Parachute troopers played a decisive role in World War II. The D-Day invasion, which led to the end of the war, began with an attack by American parachute troopers. With their parachute, the troopers carried between 90-120 pounds on their back. They were jumping into unknown territory so they had to be ready for anything! Thus, it comes as no surprise that the Prager and Rueben Company began making parachute trooper toys. The brown cloth Raggy-Doodle U.S. Paratrooper had a sewn-on aviator’s helmet and goggles. His painted aviation harness kept his heavy backpack and parachute in place. As you can imagine, T/m’s parachute trooper probably had many an adventure jumping out of bedroom windows, and off of tall trees, or maybe the occasional roof. Geronimo! With her button eyes, triangle nose, candy-striped pantaloons and orange yarn hair, Raggedy Ann is one of the most recognizable dolls around. You might be surprised to learn that the raggedy redhead has gone through a only few updates in her 100 years as play icon. 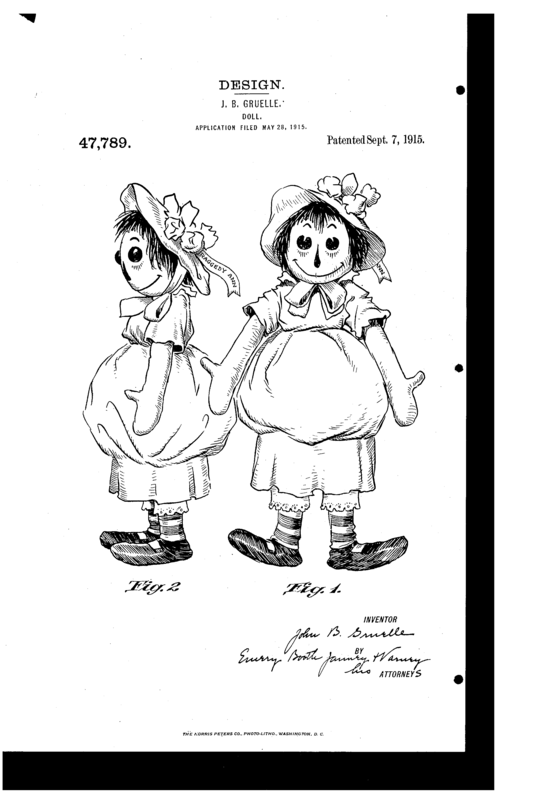 Ann’s 1915 patent shows her with very long thumbs, a teardrop-shaped nose, a puffy dress, and a floral bonnet with her namesake on a ribbon. While much folklore surrounds her creation, we know that Raggedy Ann’s creator Johnny Gruelle created Raggedy Ann (and later Raggedy Andy) for the pages of children’s books. Set in his daughter Marcella’s nursery, Gruelle’s first book, The Raggedy Ann Stories, introduced the doll who embarked on a series of adventures: raiding the pantry, rescuing the family dog, and teaching tolerance to the other dolls in the nursery. You might say the secret to Raggedy Ann’s longevity lies in her softness—both literally and figuratively.